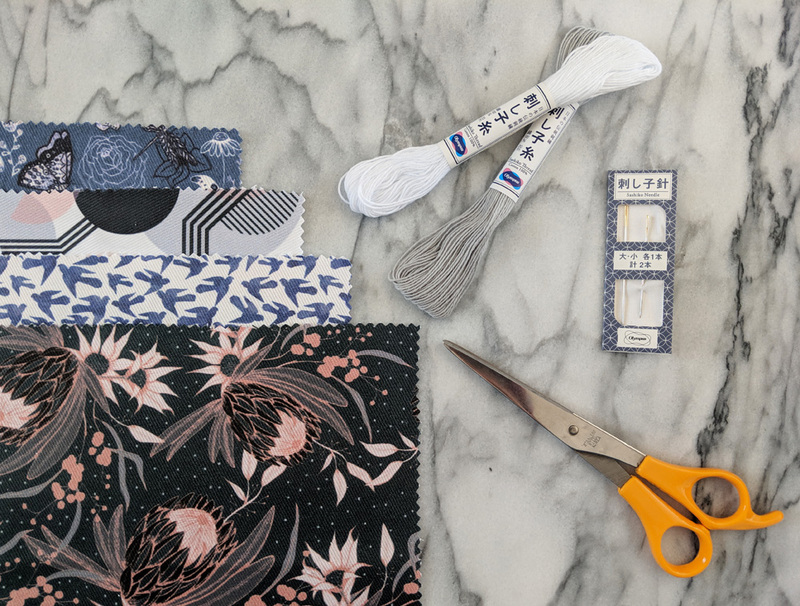 While visible mending dates back to the Edo period of the history of Japan, we’ve noticed more and more makers incorporating the hand-stitching technique into their wardrobes recently, which means less clothing making their way to the landfill! 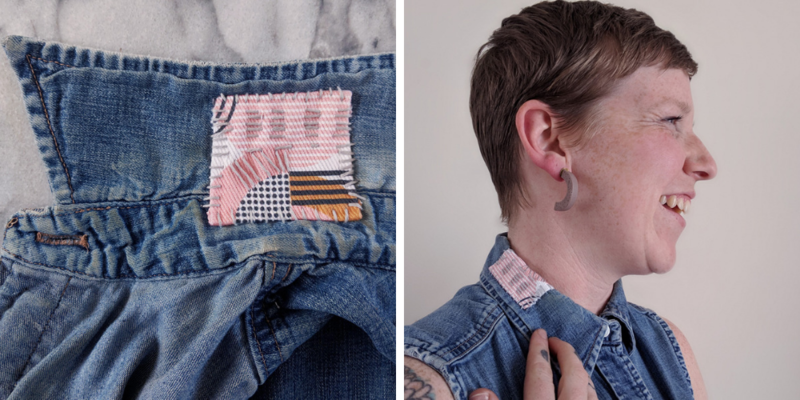 Textile artist Katie Berman of Katie Berman Textiles is sharing three ways you can incorporate this eco-friendly form of mending into your wardrobe using a swatch of Dogwood Denim™. 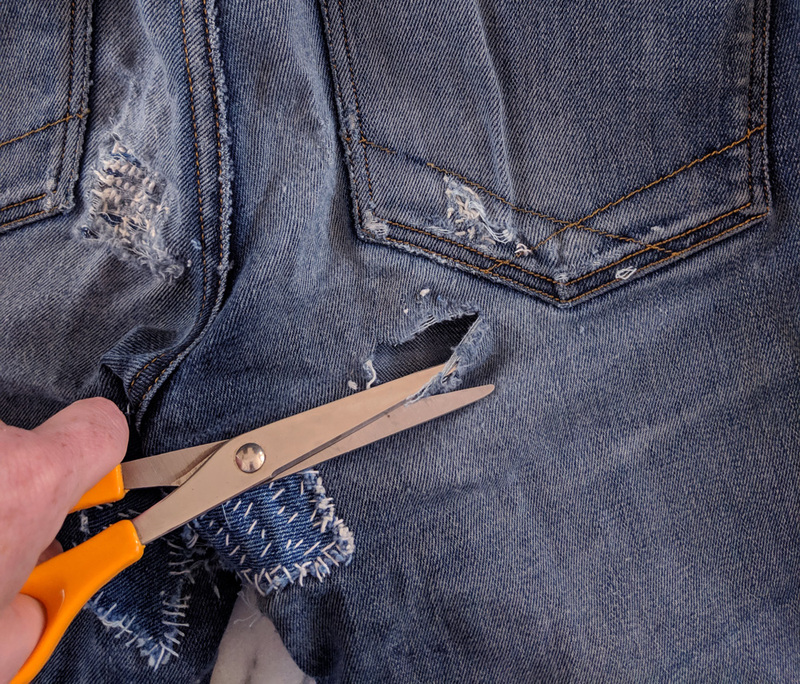 Katie: I don’t know about you, but it seems that every time I turn around I have a new hole beginning to wear away in my jeans. Most of my working life has been spent doing some type of manual labor job which means that I wear my clothes hard. Knees of pants are quickly worn away and new stains seem to appear from out of nowhere. What’s a person to do?! As someone who is attempting to cut down on my textile consumption and love my clothes well, I wanted a way to extend the life of my wardrobe. Enter visible mending! 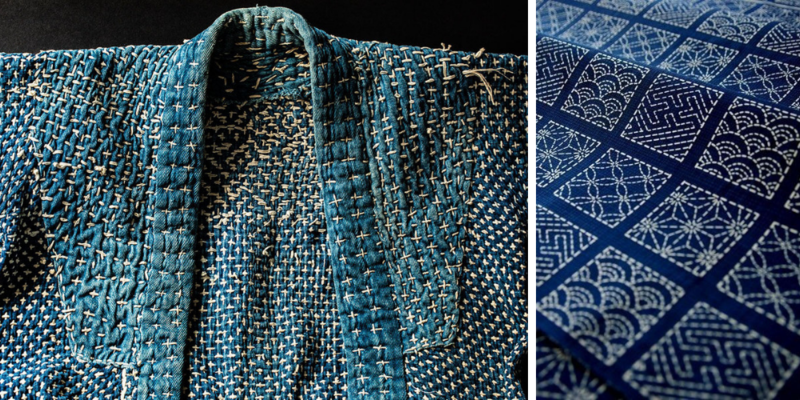 Visible mending can be traced back to the Edo era of Japan in the form of sashiko stitching. In Japanese, sashiko translates to “little stabs” referring to the running stitches that appeared on the clothing of Japanese working people. These stitches held layers of indigo-dyed hemp or linen fabrics together. In a time when clothing was a costly commodity for the working class, this helped to elongate the life of clothing, create warmth for the wearer and allowed working class folks to don decorative clothing within the confines of the law (the working class was prohibited from wearing expensive, vibrant fabrics such as silk). 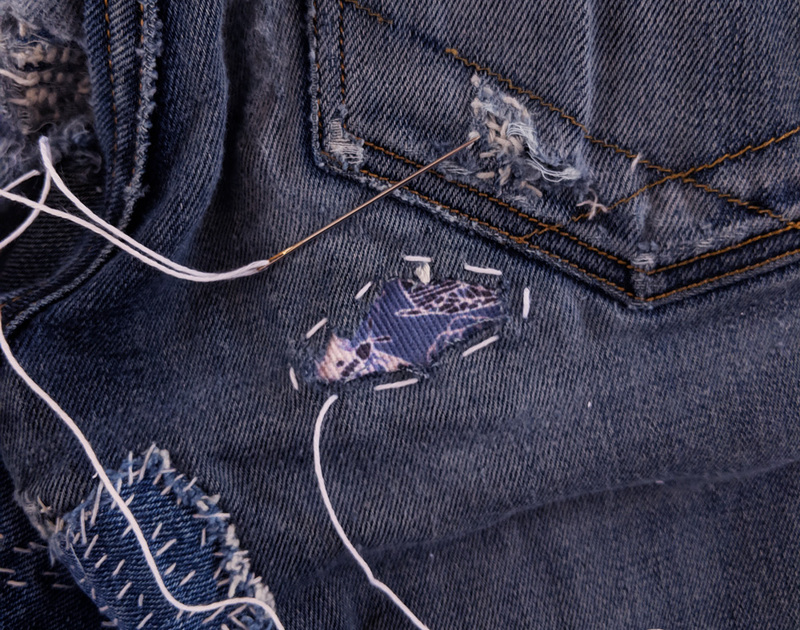 Currently, visible mending can take on many forms outside of the traditional geometric Japanese motifs. It can be used as merely decorative or serve a more functional purpose. For me, it’s both! Instead of tossing out my favorite top because I spilled coffee on it or give up on a pair of pants because my knees are exposed, I take the time to mend them. 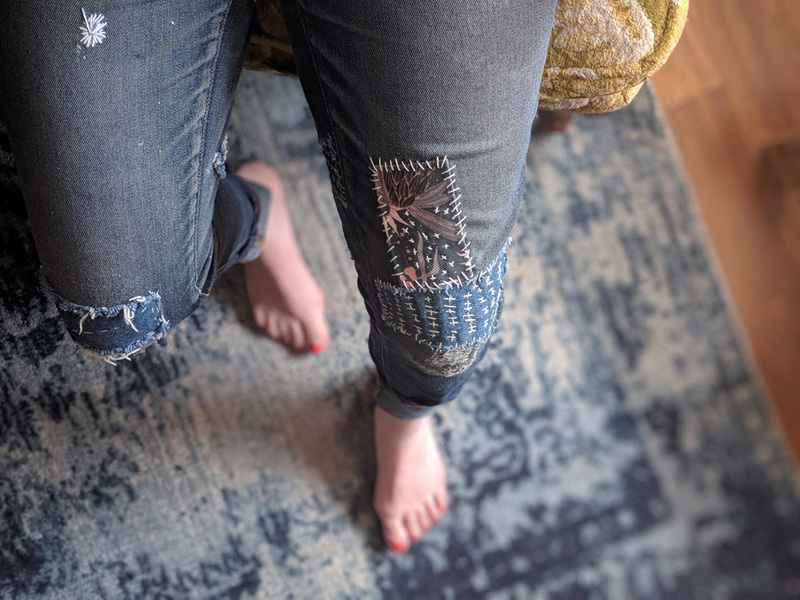 A coffee stain is now covered in a lovely embroidered floral and my jeans have a fun menagerie of patches and stitch patterns up and down them. 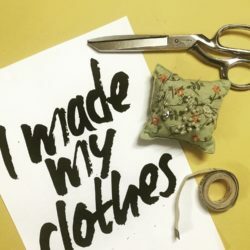 Doing this not only saves me a little money by cutting my clothing budget down, but also helps to keep unnecessary items out of the landfill and propels me into having the sustainable wardrobe that I dream about! Sashiko needles – These needles are a bit longer and stronger than embroidery needles. 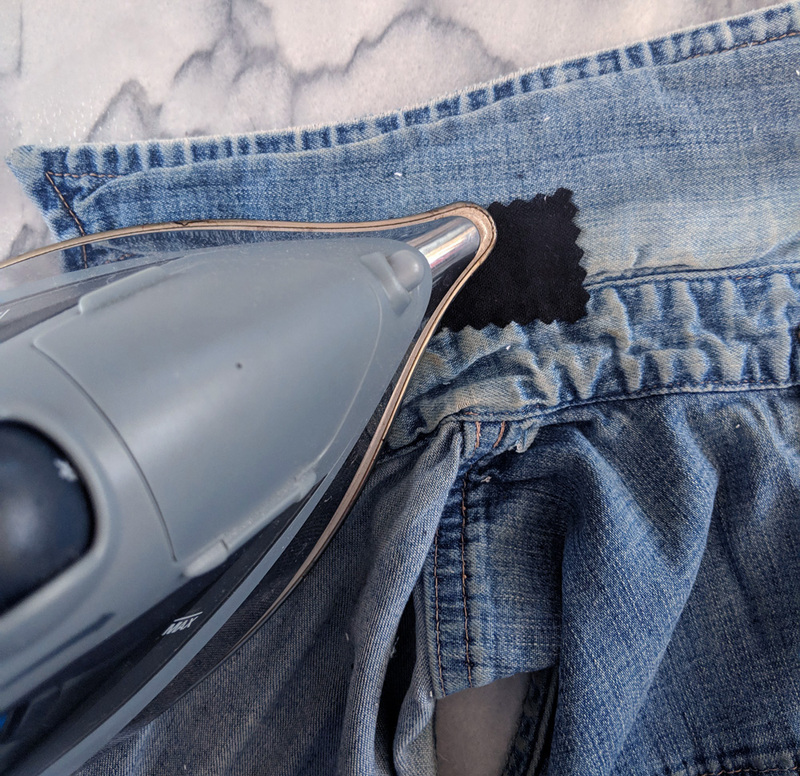 *Pro tip: When mending legs of pants or arms of shirts, I insert a coaster into the pant leg or sleeve under where I’m stitching to help me from accidentally sewing the leg or sleeve together! 1. 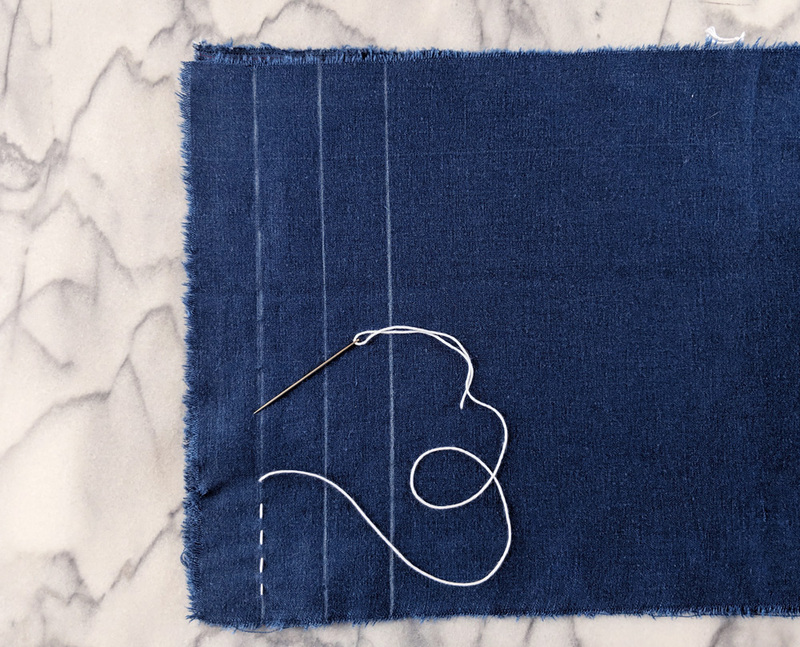 Grab your sashiko (or heavy cotton) thread and thread your needle. You can stitch with your thread doubled up or singular. I like to keep my thread singular as the sashiko thread is quite thick. 2. 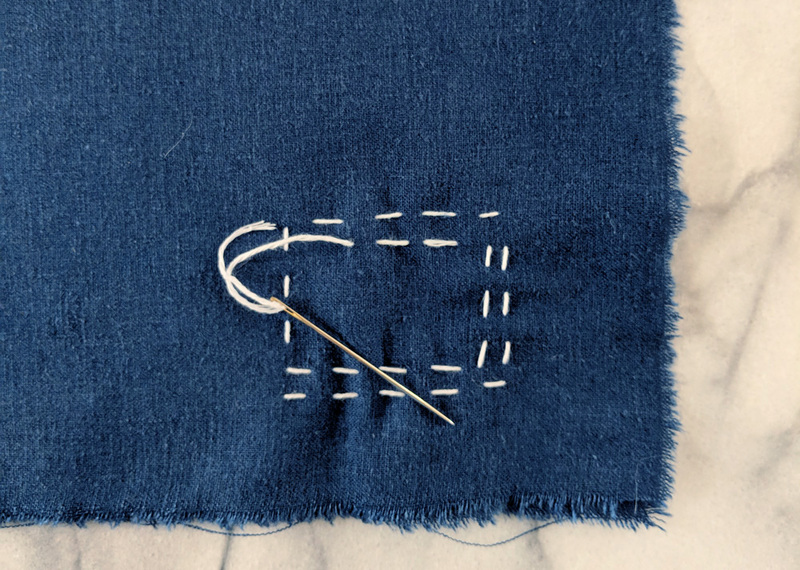 Create a running stitch by inserting your needle through all layers of fabric when sewing. Remember, we want to load up our needle and sew multiple stitches at a time. Your fabric should gather up on your needle as shown below. To achieve even stitches, make sure the puckers and pleats on your needle are relatively the same size and spaced evenly. 3. Pull your thread through to reveal your running stitch! 4. Repeat until your chosen motif is complete. Tie off/knot your thread on the wrong side of your fabric. Pro Tip: I tend to be a freestyle stitcher, but if careful planning is your jam, don’t hesitate to mark out guide lines on your fabric with chalk or washable fabric pen. I tend to categorize my mending needs into two general categories: covering up or filling a gap. A stain falls into the covering up category and I’ll most likely rely on decorative stitching alone to fix it. A hole in my clothing falls into the filling a gap category, so I’ll use a scrap fabric patch and fusible interfacing (for outside patches) along with stitching to close the gap. Sometimes when I have a small stain on my garments, I cover them up with fun stitching! 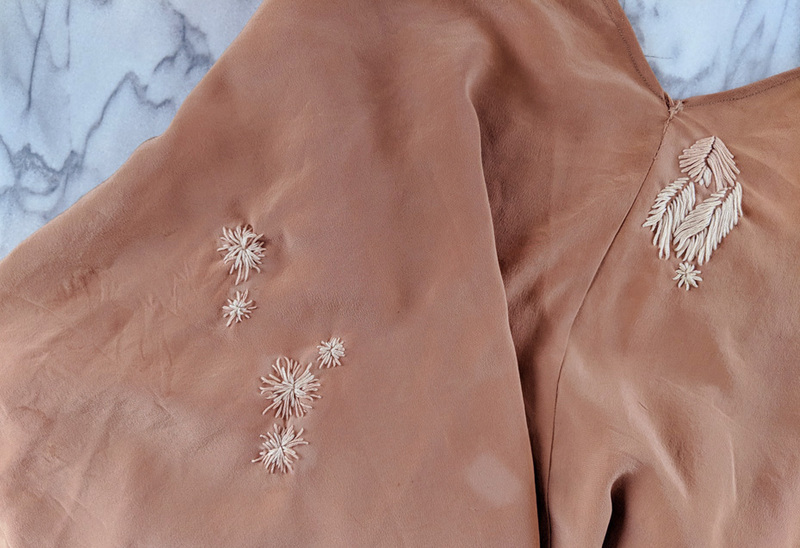 For this silk robe, I used embroidery floss to create little sunbursts of stitching over the stains I found. 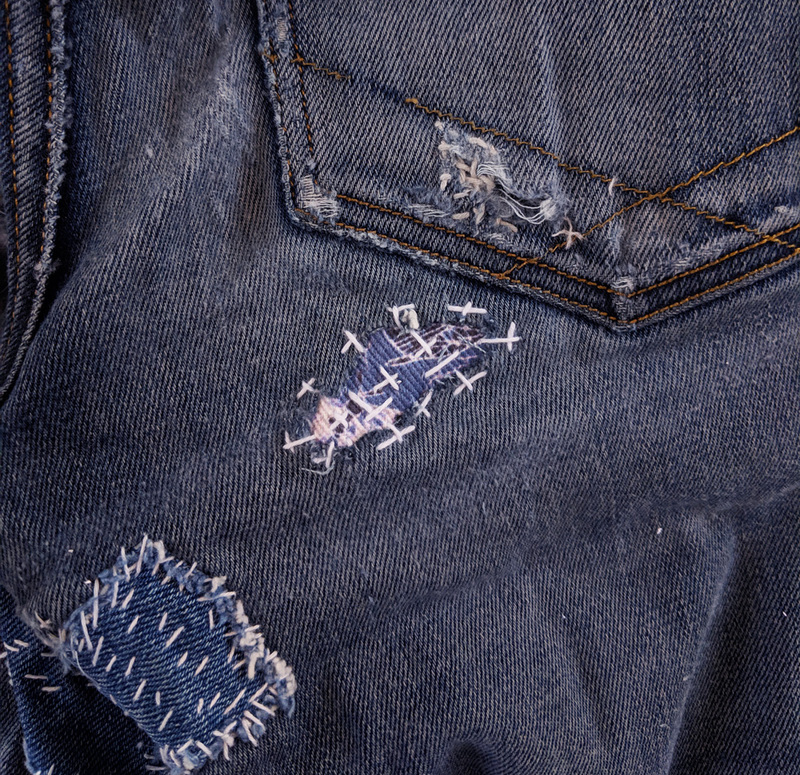 To mend a hole in a garment, I like to use patches made from sturdy woven fabrics like Spoonflower’s Dogwood Denim or Linen Cotton Canvas. You can place your patch on the inside or outside of the garment depending on your preferred look. 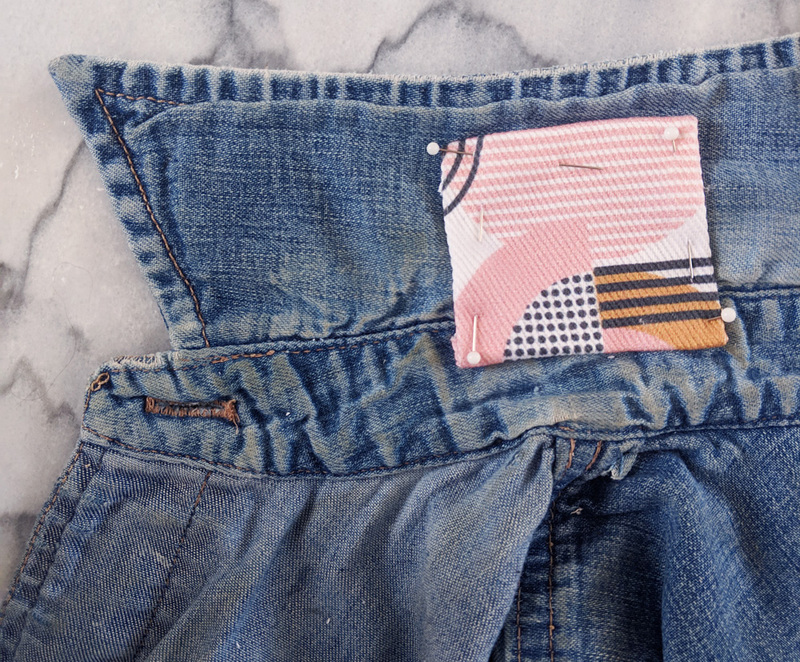 I’ve got two patches I made from Spoonflower’s Dogwood Denim, one on the inside and one on the outside. 1. Trim any frayed threads around the hole that you are attempting to mend. 2. 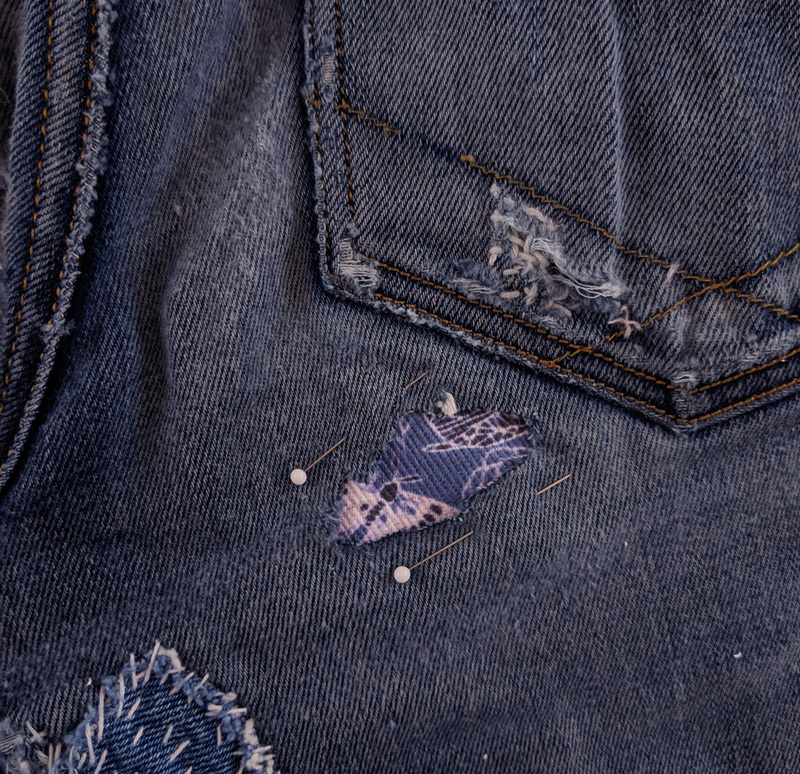 Place the patch on the inside of your garment and pin into place. Your patch should be about ¼” to ½” larger in diameter of the original hole or tear. 3. 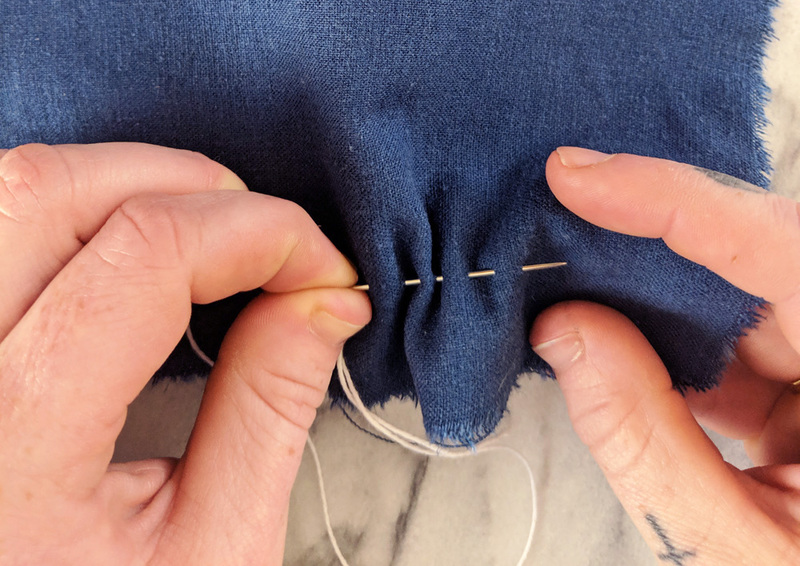 No matter how you plan to stitch or embroider your patch, you should create a running stitch around the perimeter of the hole to prevent the hole from fraying further. 4. Embroider over the patch in whatever fashion you desire! Take care to stitch over the perimeter of the hole to secure it to the patch and ensure longevity. 1. Trim away any frayed threads around the hole that you are attempting to mend. 2. Cut a piece of fusible interfacing that is slightly larger than the hole and iron on to the garment according to the product’s instructions. 3. Take the fabric that you wish to use for your patch and cut into desired shape, making sure the patch is ½ in larger in diameter than the hole. Fold and press the edges of the patch towards the wrong side by ¼ in. Pin into place over hole. 4. Secure your patch to the garment using desired stitching, making sure your stitches pass over the edges of your patch on all sides. 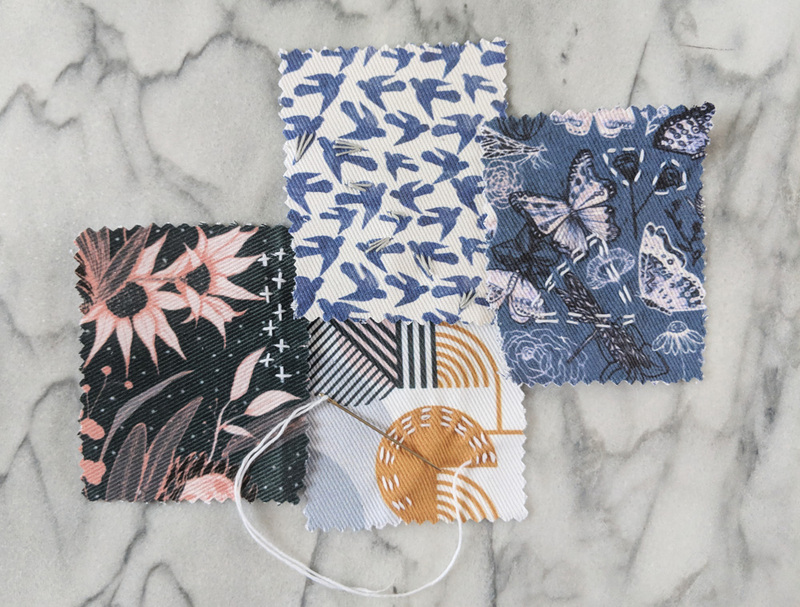 If free-form embroidery feels a little overwhelming to you, we suggest trying one of Bonnie Phantasm’s sashiko-inspired designs. The white lines can guide your embroidery stitches as you mend a hole in your clothing – and extend the life of your wardrobe! Katie is a textile artist based out of Durham, NC. 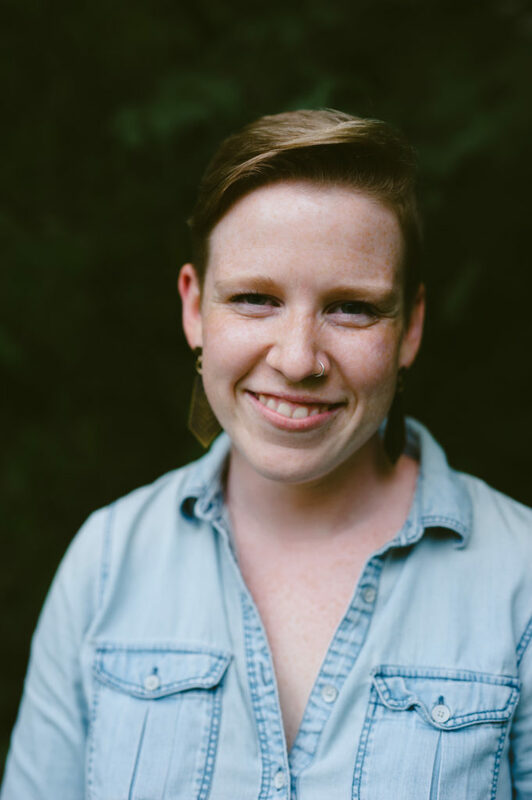 Fueled by her love to empower others to live out their creative dreams, Katie teaches fiber workshops of all kinds in her local community. 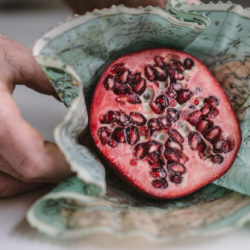 When she isn’t teaching, you can find her wrangling yarn or stirring a natural dye pot in her home studio. Follow Katie’s textile adventures on Instagram @katiebermantextiles or her website. I think I would want to mitre the corners on the squarish patch.